The South American Handbook, first published in 1924, and still regularly updated, shows how much - but sometimes also how little - the region has changed over the last nine decades. It also reveals how British business left a strong mark on Chile in particular, writes Gabriel O'Rorke. The guidebook was produced by the Federation of British Industry for traders travelling to South America for work, and sold for 7/6 (seven shillings and sixpence - 37.5p after decimalisation). The editor was William Koebel, a merchant and author from Forest Hill - then a village in Kent, now a suburb of south-east London. The Chile section of the book opens with Valparaiso, "the normal point of landing for voyagers by sea". It was the first major port for ships that had rounded Cape Horn from the Atlantic, and the last for those heading in the opposite direction. Its golden age was already coming to an end in 1924, thanks to the opening of the Panama Canal 10 years earlier. Ships heading to the Pacific now had a short cut through the Caribbean. Today it's still Chile's main port, but the rise of air travel has cast it further into the shade. "The street scenes are picturesque," the guide says, adding that locals wear "gaily coloured ponchos". Nowadays the city itself strikes one as more gaily coloured than its citizens. The bright corrugated iron houses, dating back to the early 1900s and originally decorated using ship paint, helped Valparaiso become a Unesco world heritage site in 2003. Another burst of colour comes from the city's renowned graffiti artists, who started using walls as canvases in the 1970s, as a form of protest against the dictatorship of Augusto Pinochet. Now there is an annual competition. Completely familiar to the original readers of Koebel's guidebook would be the 100-year-old "ascensores", or wooden funiculars, set on near-vertical tracks and constructed using British-built machinery. The guide describes how from "the edge of the blue waters, on its circular shore, the buildings rise tier above tier up the hills". It goes on: "A city, a port, a bathing and a pleasure resort, all in one, it is a city of surprises, with lifts to take one up the cliff." One is called the Ascensor Reina Victoria (Queen Victoria Funicular). It takes you to Atkinson Street, in the heart of the old British Quarter. Valparaiso is often likened to an amphitheatre as it consists of 45 "cerros" (neighbourhoods, or literally "hills") overlooking the bay. Two of these, Cerro Alegre and Cerro Concepcion, were largely planned and developed - complete with squares, promenades and viewpoints - by German and British immigrants. These immigrants slowly integrated, or moved on to more prosperous shores, as the Panama Canal diverted trade, and after the nitrate boom ended in the 1930s, leaving behind buildings they had constructed in styles just like those at home (and often with names typical of their home countries). Move 116 miles inland to Santiago and the same has happened in neighbourhoods like Concha y Toro, where once-vibrant European communities dispersed, leaving behind neo-Gothic and Baroque architecture. Chile's capital has expanded around the middle. The handbook describes it as covering "about five square miles" - today it's many times that size. In terms of population, Santiago has grown from 686,000 to more than six million in the course of a century. However, William Koebel's description of it as "one of the most beautifully situated capitals" still rings true. The handbook describes Santiago as crossed from east to west by the Mapocho River and backed by the Andes. Snow-capped in winter, bathed in bright pink at sunset, the Andes Mountains still surround the city, of course, and the river still runs through it. As for points of interest, top of the list in Koebel's book is Santa Lucia Hill in downtown Santiago "rising a sheer 400 ft, affording magnificent views… almost in the centre of the city and ornamented with gardens, balustrades, and balconies". Today Santa Lucia still rises up from the pavement like a piece of confectionery, and is popular with courting couples and view-seeking tourists alike - but plenty of buildings are now higher. When it comes to Chileans themselves, Koebel claims they "call themselves the Britons of South America". He then adds a word of caution: "Manners are different in Chile, and on the fashionable promenades youths stare at ladies as they pass, and make audible remarks on their appearance. This is not rude according to the Chilean canons, but rather correct conduct." Little has changed. Modern guidebooks carry similar warnings. Fodors says: "Chilean men are less aggressive in their machismo than men in other South American countries… but it's still an aspect of the culture (they will make comments when a woman walks by)." When it comes to Chile's largest indigenous group, the Mapuche, Koebel's guide takes quite a progressive stance. It talks of Mapuche victimisation and problems with assimilation, predicting that the future will bring "cause to lament the disappearance of a brave and interesting race". As it happens, the Mapuche haven't disappeared, yet Koebel was right in a way. They account for just 9% of Chile's population and stage frequent protests to demand better political representation - and to complain that forestry companies are encroaching on their ancestral lands. After listing Santiago's best spots for tennis, golf and horse racing - most of which still exist, including Los Leones Golf Club which was founded in 1910 and still maintains its exclusive edge - the 1924 handbook moves on to other key towns and cities. Two themes are recurring in what follows: mining and railways. Although the tide has turned from nitrate towards copper, mining still powers the Chilean economy. The country is responsible for about a third of global copper output. The railways, however, tell a different tale. In the 1920s the train service stretched 1,865 miles (3,000 km) from Arica in the "rainless" north to Puerto Montt in the Lake District. Today, the state-run railway Empresa de Ferrocarriles del Estado (EFE) travels southbound from Santiago, making a 250-mile (400 km) trip to Chillan several times daily. But northern Chile's train stations have become museums. Arica Railway Station, for example, dates back to 1906, but due to lack of demand, passenger services ground to a halt in 1996. Antique trains built in England and Germany stand motionless on the platform. When the handbook reaches Patagonia it describes the southerly Chilean town of Punta Arenas as a "great cattle, sheep and wool centre". It also mentions that it is "within wireless connection with Valparaiso". Koebel also mentions that a new wireless station is "being erected at Ultima Esperanza, adjoining the Freezer at Puerto Bories". Built by the British in 1915, this Freezer was a cold storage plant used to process mutton and sheepskins to be shipped back to the UK. Business ceased in 1971, but the redbrick factory still contains original Victorian machinery bearing the mark of manufacturers in Derby, Birmingham, London and Glasgow. In 1996, it was named a Chilean national historic landmark. The steam condensers, boilers and forges now find themselves within the walls of a luxury hotel, The Singular, which opened in 2011. 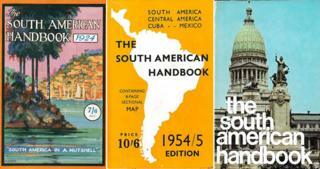 The South American Handbook is said to be the longest-running English-language travel guide in existence. It was originally produced because British people wanted to invest in Chile, and targeted at merchants, traders and businessmen. Updated annually, and now published by Footprint, today its readers are backpackers, tourists and holidaymakers. The original version still has a certain charm though - and lots of fascinating historical insights.